If your home has a basement with windows at, or slightly below, ground level, it’s quite likely that you also have window wells. Without these, the view out of your basement window will be, well, dirt. The window well not only lets you see out but has some other important functions as well. A window well is a U-shaped, ribbed metal or plastic product available in most home hardware stores, which is designed to fit around basement windows which are either at or below grade. In order to fill all windows, they come in several different widths and heights. A window well allows basement windows to have some view, lets light into the basement, allows you to climb out the basement window in an emergency, and if properly installed and maintained, it provides a way for water to run away from the house rather than in the window. The dirt near the window is dug out, to a depth of about 1 foot below the bottom window sill. Then, the semi-circular corrugated steel or plastic “wall” is placed in the hole to prevent the dirt from falling back in. This is called a “window well” and just like a regular “well,” it gathers water. If proper drainage hasn’t been built into the well, usually in the form of a deep layer of gravel, you could wind up with water pouring in through your basement window. This would not be an ideal situation. When water leaks into basements through the windows, people often have their windows replaced unnecessarily, assuming that a poorly fitting window is the problem. Windows are designed to shed water, but they’re not usually waterproof. So if water is backing up in the well, it will naturally find a way into your house through the window, no matter how tightly it is sealed. Window wells should be used where the bottom of a basement window is at or near ground level. They not only allow for proper grading but they also prevent dirt from rotting window sills. The outer edges of the window well should surround the window and be tight against the basement wall. The bottom of the window well should be at least a foot below the bottom of the window sill. The area inside the window well should be cleared of dirt and backfilled with loose gravel or rock. This should be done from the bottom of the well to three to six inches below the bottom of the window sill. This will allow water to easily drain and filter down to the foundation weeping tile. In extreme cases, a pipe may have to be inserted that runs directly from the bottom of your window well towards your weeping tile. The dirt or sod on the outside of the window sill should be graded like the remainder of the house. If you haven’t got a drain in your window well, and want to install one, you should seriously consider calling a professional. It’s a fairly major undertaking, and if not done properly, could cause even bigger problems especially if you want to install a window well as a part of your deck. Exterior drain: Installing a drain in your window well involves manually digging down (machines could cause damage), along the basement wall, right to the base of the home’s foundation. A drain pipe is then installed to drain water away from the well, instead of filling it up. It extends from about 4″ below the window sill, all the way down to the top of the weeping tile or perimeter drain. Gravel will then be shoveled in to direct water to the pipe, and to allow any excess water to drain away. Interior drain: With this method, instead of connecting the drain to your weeping tile or perimeter drain, you’re actually directing the water inside your house. A hole is drilled though the foundation wall, below the window sill. A pipe is placed in the hole, and down the interior wall to connect to a sump pump. Basement Technologies has a good step by step description of Exterior and Interior drains, as well as the pros and cons of each. Snow, leaves, or other debris pile up: Check your window wells regularly to make sure they’re not filling up with debris. If the well becomes packed with snow or leaves, there will be nowhere for any water to drain away from the window. Soil enters the well and plugs the drain: Soil can enter the well and cause problems if the window well is the wrong size. If it’s too narrow, soil may push in from the sides. Or if the well is too short, water may wash over the sides, carrying soil with it, and plugging the drain. Remember that window wells are available in all shapes and sizes so be sure to measure your window and consult an expert before installation. Gravel becomes like cement: Over time, wet sand and dirt can clog up the gravel, and will prevent water from draining. It may be time to shovel out the gravel, and either replace it with new gravel, or simply spread it out, and rinse away any dirt, sand, or other debris, and shovel the clean gravel back into the well. Window well not fastened properly to the wall: As your house settles, or simply due to the ground freezing and thawing over time, the window well can move, and come away from the house. This then allows dirt to start pushing in and can clog the drainage system. If this happens, the window well may need to be dug out again, and a new well attached to the home, plus a new layer of gravel. Window wells should always fit tightly against the basement wall. Water on the floor beneath the basement window: To see if the window well drainage is the problem, get a hose and run water into the well to see how quickly it drains away. The water level might rise a bit but shouldn’t come near the bottom of the window. If it’s running away as it should, there may be a completely different issue, such as a crack in the home’s foundation near the window, which is allowing water to enter. What can you do to maintain your window well? Proper maintenance will prevent water, dirt, and debris from coming into contact with your window, getting in your basement, and causing all kinds of problems. One of the biggest problems, as mentioned above, is with debris clogging the window well. The gravel should always be clean and loose, so water can easily flow away. Clean the window well out regularly, and if you have a real problem with debris or excess water accumulating in the well, you might want to consider getting a “bubble cover” to place over it. This will prevent water or debris from entering, while still letting light into your basement window. There are other types of window well covers as well, such as a grill-type metal cover, which can be a bit more expensive but may also be more durable. Anything will wear out over time, but with proper maintenance, your window wells should last a long time. There are many different materials available, with the most common being corrugated steel. 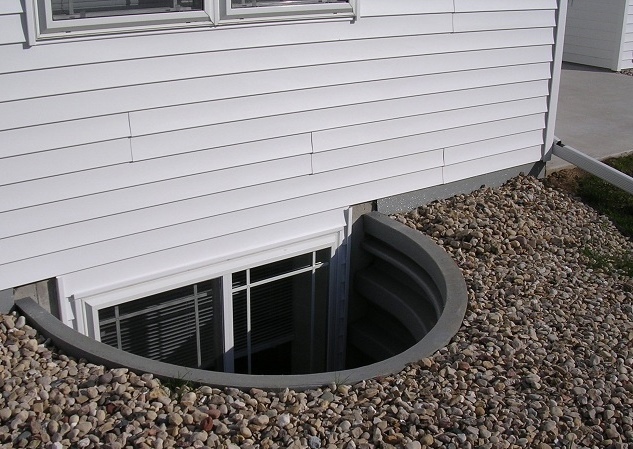 If your basement suddenly floods, it may be obvious that the window well needs replacing. Before that happens, you could look at the well itself for signs of aging, such as rust, or bumps. These signs could be an indication that it’s time to replace the window well. You could make it a habit to closely inspect your window wells, say, every fall or spring. If you notice anything, you may want to call in a professional for some help to make sure repair or replacement is done properly. The drain pipe itself, if there is one, may also become clogged over time, and need to be replaced.